This hydraulic clamp is actually the right machine for high-volume producers of furniture doors and it is absolutely necessary to those who manufacture such products with special features and frequent changing size of the products, ideal solution for general assembling with 45° or 90° joints without any previous setting. 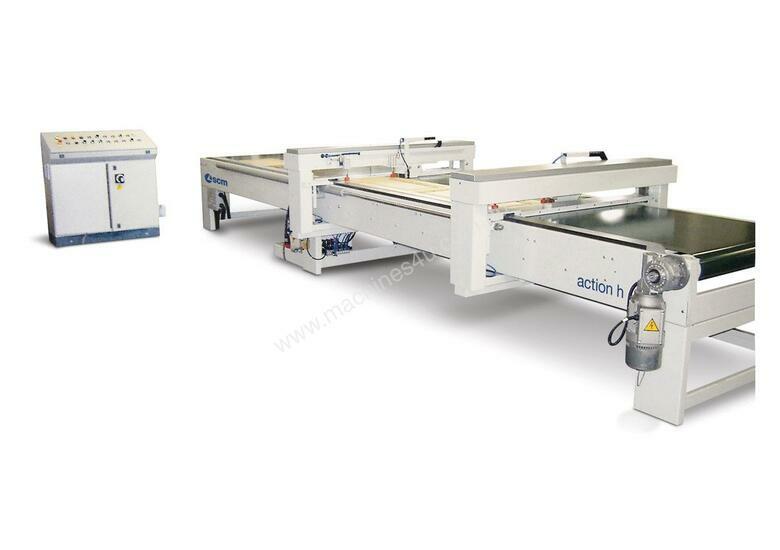 This machine model is fully automatic: it is auto-positioning according to the dimensions of the cabinet door incoming to the press. It is not necessary to perform any manual action for the piece positioning: small series and special items can be easily processed at the same production rate as big standard series. The pressing force can be adjusted according to the type of door to be assembled. The basement is made of high thickness, suitably reinforced and machined steel sheet. The hydraulic equipment’s features are technical characteristics studied in order to have absolute noiseless operations. The door pressing time is adjusted by means of a timer located on the electric control panel . The operational system is controlled by PLC. Further to the standard machine operation program, there is a wide range of software options available for special operative cycles or for remote connections to other system. • Possibility to assemble frames with 45° or 90° joints without any previous setting. • Small series can be easily processed at the same production rate as large standard series, due to auto-adjusting of machine to the product’s dimensions. • Pressing power can be adjusted according to the type of frame to be assembled.